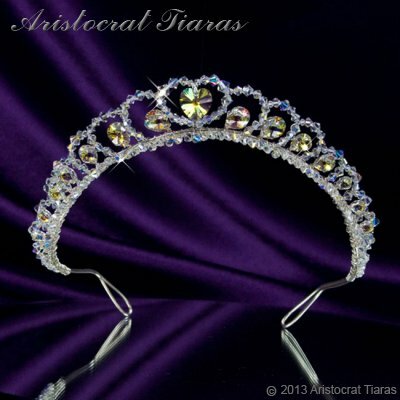 Inspired by the stately occasions of the 2012 Jubilee, the Princess Sophie Swarovski tiara from Aristocrat Tiaras is the perfect blend of elegance and sparkle with understated simplicity and a delicate, yet truly eye catching tiara to complete your bridal wardrobe or to enhance that special prom dress. Princess Sophie is created from exactly 200, top quality Swarovski crystal beads woven into a sliver frame. The centre-piece of this crystal tiara is a heart shaped with crystal beads suspended within a a sparkling 14mm heart bead and complemented by 14 pear drop beads of diminishing sizes along the band to create a truly stunning effect. Countess Mia necklace or Countess Alyssa necklace are designed to compliment this crystal bridal tiara.